Today is Josephine’s 20th birthday, but this entry is about Granny. Granny always comes over to our house when one of us has a birthday (ie 7 times a year for birthdays alone) and we love seeing her here or at her house nearby as often as we can. Before supper, Gran recited a few poems for us. She still has uncountable stories and poems memorized from years ago, and delivers them with real passion. She’s a wonder to listen to – I should tape record her telling her poems and stories, they would make excellent audio files to play to children. I’ll try and record one sometime and post it here. We had a nice supper of smoked salmon and stir fry, as requested by the birthday girl, and afterwards I asked Gran if she’d like to play some ping pong – and of course, she said yes. Granny is 96 years, 7 months old. 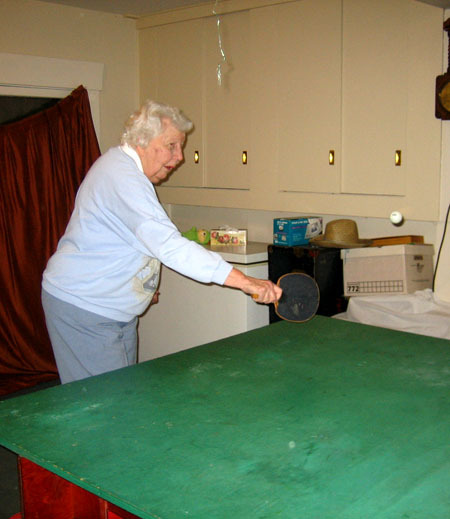 This entry was posted in Canada, North America and tagged Birthdays, Granny, Ping Pong. Mmm. I heard about the ping-pong match earlier from your cinematographer — colour me impressed. I know people 46 years younger than Granny who are nowhere near that spry. The downside to freeware is that you’re getting what the coders thought would be useful for themselves, rather than a polished product that was actually intended for mass consumption. It’s the same problem that has been plaguing Linux and the entire OSS movement for quite some time: nine times out of ten, geeks can’t be bothered writing slick GUIs for their software. I know that whenever I write code, I’ll only throw in a GUI if I’m writing software for older people or if it’s required in an assignment. Text-based interfaces are an order of magnitude simpler to code, and I actually find them a lot more powerful in most cases. As far as your older comments on -isms, which I completely forgot to reply to in a more timely manner… I tend to stuff optimism, pragmatism and pessimism at the left, centre and right ends of a spectrum, respectively. It’s been my experience that most people who claim to be pragmatic strike a balance between assuming everything will work out wonderfully (optimism) and assuming that nothing will work out wonderfully (pessimism); the pragmatists that I’ve met tend to be optimists with a touch of down-to-earthness. So, long story short: optimistic pragmatism is quite doable — it’s actually the direction in which I tend to lean, myself. you should have let your granny won or at least catch up to your 21. wish i had a granny i could play ping pong with… and a happy 20th to jo! anyways, good times on saturday night. i so wanted to go bowling but, pool was fun too. the candid pics are up! did you guys go karaoke? PS. ams castle prank = pure genius! it makes me wonder what kind of pranks they pulled off in the years before. those ubc engineers are hillarious. they have a video on youtube. if i find the link i’ll send it over.